PNV J17395600-2447420 : Possible Nova in Oph | KAO blog. We performed low-dispersion optical spectroscopic observations of the possible nova in Oph (CBAT name is PNV J17395600-2447420 ) using 1.3m Araki telescope with LOSA/F2 (R~580 at H-alpha) on 2012 May 22.62 UT. 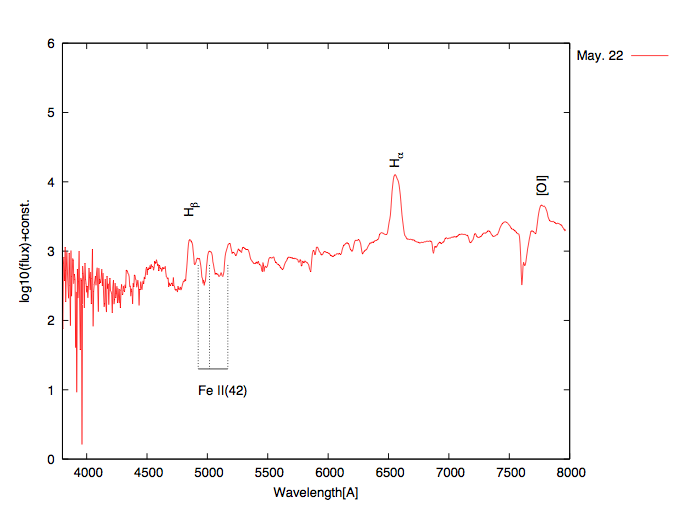 Their spectra of the object exhibits broad H-alpha(FWHM about 2800 km/s), H-beta , FeII multiplet and OI(777.4nm) emission lines on a reddened continuum emission. 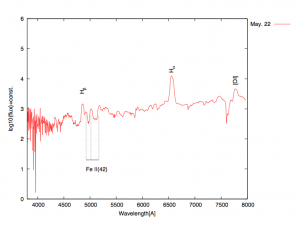 No P-Cygni profiles were detected in their spectrum. These features suggest that the object would be a classical "Fe II"-type nova.